Present Owner: Sipiweske Museum Inc. This Anglican Church was built in 1882 to serve a small group of English settlers who had arrived in the district the previous summer. Located approximately 22 km south of Brandon, the hamlet eventually took its name from its first postmaster, Samuel Rounthwaite. The church was completed under the direction of Reverend John Frederick Rounthwaite, the brother of Samuel. In 1890, the hamlet and church were moved 2 km west to SW 24-8-18WPM to be on the newly built Northern Pacific and Manitoba Railway. Over the years the congregation dwindled and in the autumn of 1982, after a hundred years of service, the church was formally closed. In 2002 the Church was moved to its current site in Wawanesa. 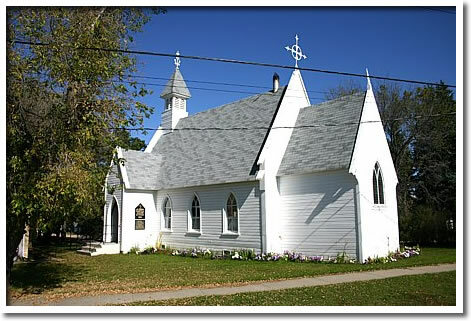 St. John the Divine is one of the oldest Anglican churches in Manitoba, and its pointed windows, vertical proportions and fine interior details make it an exemplary example of High Victorian taste. In the 1930s, some alterations were made to the exterior, including the addition of new siding and the removal of the clerestory dormer windows. The interior, however, remains virtually unchanged from the 1880s and features a barrel vault ceiling, an ornate wood-burning stove and many original furnishings.